After building an addition onto the other side of their house, the homeowners of this single-story home were able to completely reuse the old master bedroom, bath, laundry, pantry, closet and kitchen/breakfast room. 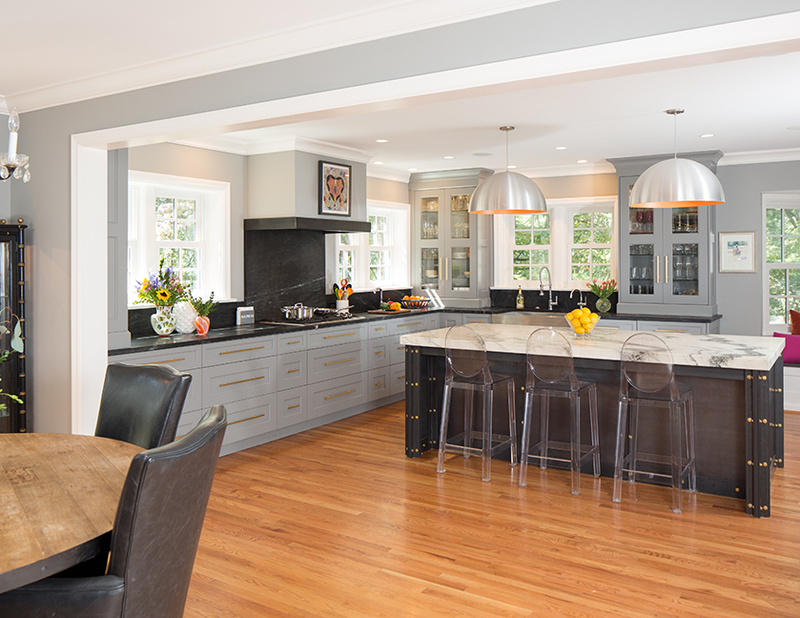 The kitchen was redesigned by Gegg design & cabinetry to allow for optimal flow between the new breakfast area and family room. Access also was created to the formal dining room by relocating the original doorway and adding a second. The new kitchen incorporates several unique features, most prominent being the custom steel island. Being a budget-sensitive project, the challenge was to come up with a steel island in a cost-effective design. Common mill steel components with a wax finish were combined with a unique leg design. The pieces were fastened together with unfinished brass hardware that will naturally patina. Another unique element is the hood. Designed to be simple, the hood also incorporates a steel band around the bottom to tie in with the island. The design called for minimal wall cabinets, but they all come down to the counter to maximize storage. 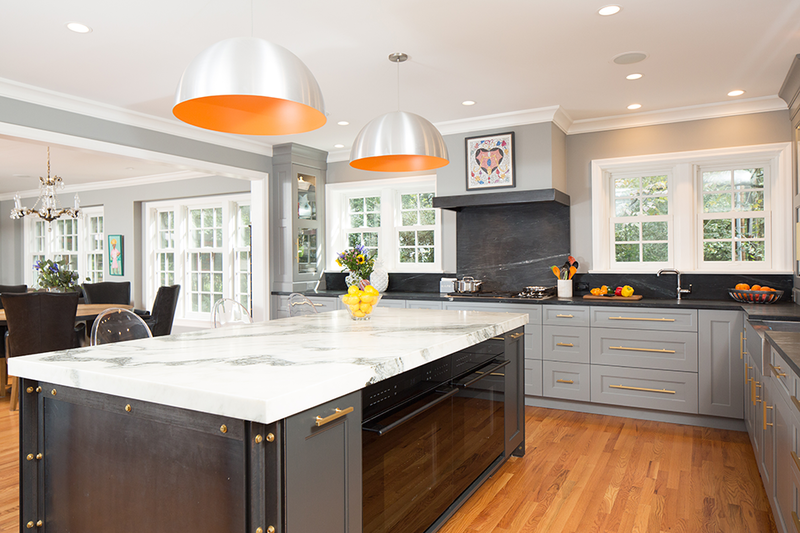 Other features include gray, custom-painted cabinetry; long, square brass pulls; integrated refrigerator/freezer and dishwasher; glass-front wall cabinets with glass shelves; drawers throughout the work area; soapstone countertops and backsplash; double-thick Danby marble on the island, and stainless lights with orange interiors. The end result is a highly functional kitchen that is interactive with the breakfast room, family room and dining room. This kitchen is incredibly unusual, especially the use of brass. The island is well designed. We love how the glass wall cabinets are consistent with the windows. The mixing of materials and use of metal, steel and soapstone are fantastic.